This article is concerned with the United Nations (UN) recognition of Palestinian statehood in November 2012 and evolving implications in the context of international relations, law and politics. 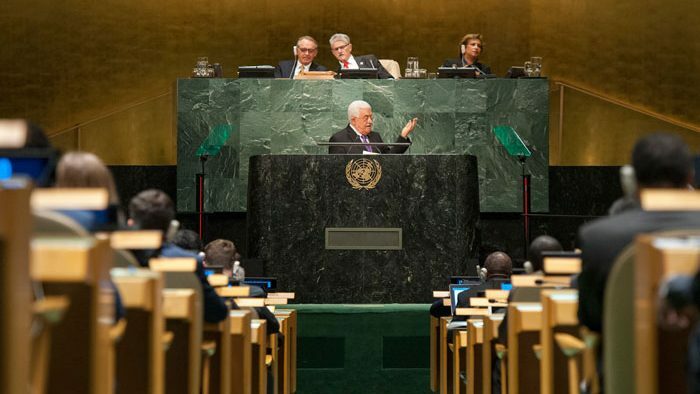 As Palestine continues to demonstrate a greater engagement in the international arena and utilize the status of a non-member observer State, revisiting the question of Palestine’s membership at the UN becomes increasingly important. Voting to admit Palestine into the UN as a non-member observer State in 2012 provided a clear UN recognition of Palestinian statehood. Recent developments have shown that the issue of the UN recognition of Palestinian statehood represents both contention and evolving implications with promising possibilities. In some cases, it has resulted in diplomatic frictions and disruptive withdrawal from international organizations and treaties which have defined the international order since the Second World War era. Two cases are worth noting in particular. First, since January 2019 the US and Israel have formally decided to withdraw from the United Nations Educational, Scientific and Cultural Organization (UNESCO). This decision has origins in granting full membership of UNESCO to Palestine in October 2011. Following the admission of Palestine, the Obama administration withdrew approximately $60 million in financial support for UNSECO (McMahon and Masters 2012). The US measures against the organization represented both protest and punishment for Palestine’s membership. The current US administration under Trump took further radical action and, along with Israel, declared its formal disengagement from UNESCO. The second case is of equal importance. In October 2018, the US issued a declaration of withdrawal from the Optional Protocol to the Vienna Convention on Consular Relations concerning the Compulsory Settlement of Disputes of April 1963, which provides the International Court of Justice (ICJ) with jurisdiction to resolve disputes between States. The US decision came after the State of Palestine challenged the relocation of the US embassy to Jerusalem at the ICJ and cited the illegality of this decision based on international law and breaches to the Vienna Convention on Diplomatic Relations of April 1961 (International Court of Justice 2018). Both cases, the US-Israeli disengagement from the UNESCO and the US withdrawal from the Optional Protocol to the Vienna Convention, expose deeper contention concerning Palestine’s membership and statehood recognition at the UN and makes it more critical to revisit these issues, including their developing implications, today. Therefore, the main argument in this article is that the UN recognition of Palestinian statehood has continued to present major and evolving implications in the areas of international relations, law and politics with promising possibilities for the Palestinian quest for recognition and statehood including (a) the emergence and increasing acceptance of Palestine as a legitimate state actor in international organizations and the UN organs, (b) securing and utilizing access to international mechanisms of justice and conflict resolution including the ICJ and the International Criminal Court (ICC), and (c) transforming unequal power relations between Israel and Palestine at the political level. To unpack this historical context and examine these evolving implications of accepting Palestine as a non-member observer State at the UN, this article presents an overview of Palestine’s membership at the UN and the quest for recognition in 2011 and 2012, and an analysis of the evolving implications and associated promising possibilities resulting from the UN recognition of Palestinian statehood. In September 2011, Mahmoud Abbas, the Palestinian President and Chairman of the Executive Committee of the Palestine Liberation Organization (PLO), submitted an application to the UN Secretary-General requesting UN membership on behalf of the State of Palestine. The application and accompanying explanatory notes framed the membership question upon the UN resolutions and “Palestinian people’s natural, legal and historic rights” (United Nations 2011). The application made a clear reference to the UN resolution 181 of November 1947, which suggested the partition of Palestine into a Jewish State and an Arab Palestinian State, and resolution 43/177 in December 1988 concerning the Declaration of Independence of the State of Palestine in November 1988 and the UN official acknowledgment of the Declaration. In addition, the application included a clear commitment to a negotiated settlement with Israel on the basis of the internationally agreed vision of “two-States living side by side in peace and security” (United Nations 2011). In particular, the Palestinian official position on the UN admission and recognition of Palestine was informed by a number of legal and political arguments including (a) the UN partition plan since 1947; (b) the UN resolutions affirming the right of the Palestinian people to self-determination and statehood; (c) the consistency of Palestine’s recognition with the Oslo peace agreement which recognized the mutual political rights of both sides; (d) recognition of Palestine as a legal and nonviolent action that supports the application of international law to the occupied Palestinian territories; (e) the enhancement of the prospect of reaching a negotiated settlement through recognition and UN membership; (f) the protection of the two-state solution by affirming Palestine’s right to statehood and independence; and finally (g) Palestine’s fulfilment of the statehood requirements including its capacity to establish relations with other States, the existence of a permanent Palestinian population and a defined Palestinian territory on the basis of the 1967 border (Palestine Liberation Organization-Negotiations Office 2011). The Palestinian arguments were grounded in the area of law and politics and, despite the failure of the first attempt to gain recognition and admission of Palestine at the UN because of the threat of the US veto and Israeli opposition in November 2011, they gained international acceptance which contributed to the successful admission of Palestine to the UN as a non-member observer State in November 2012. 138 out of 193 UN member states supported Palestinian membership and 9 voted against including Canada, the US and Israel. The US, Israel and their allies explained their opposition in the context of violations of the Israeli-Palestinian peace agreements, unilateralism and the delegitimization of Israel. The US representative to the UN, Susan Rice, referred to the UN vote as “unfortunate and counterproductive” as well as leading to “further obstacles in the path of peace.” Canada also described the Palestinian initiative as a “unilateral step” and declared its opposition prior to the UN vote (United Nations 2012). Israeli Prime Minister, Benjamin Netanyahu, gave the warning that any UN vote is “meaningless” and his Defence Minister, Ehud Barak, described the developments at the UN as “an impending diplomatic tsunami” (Elgindy 2011). International support, on the other hand, has been framed in the context of justice, equality, right to self-determination and the two-state solution to the Israeli-Palestinian conflict. The representative of China, for example, declared that his country supported the admission of Palestine to the UN and considered it to be “another positive step in Palestine’s progress towards statehood.” Russia described the UN vote as a significant contribution towards “reinstating historic equality.” The Norwegian representative declared that Norway had voted in favour of the resolution because “Palestinian people had the legitimate right to self-determination.” Moreover, the representative of France explained that by voting to recognize Palestine as a non-member Observer State, “France had voted in favour of a two-State solution, Israel and Palestine, living side by side in peace and security, within secure, internationally recognized borders” (United Nations 2012). Within the Palestinian territories there was support and opposition reflecting further the legal and political debates which characterized the nature of the Palestinian issue for decades. The supporting views saw the UN membership as a recognition of Palestine’s right to political independence and a welcome return to international law in Palestine’s struggle. Opposing arguments criticized the lack of clarity concerning the statehood recognition and the legal and political rights of Palestinian refugees inside and outside of Palestine in the diaspora. In addition, some commentators on Palestinian affairs saw it as a way for the official leadership of the Palestinian Authority to improve its weak standing and provide further concessions to Israel in future negotiations (Abunimah 2011). Although the basis of support and opposition has been clearly expressed, a new and changing reality has slowly been materializing in the post years of Palestine’s admission to the UN. This reality is examined and analyzed in the following section. One of the major and developing implications of the UN membership and recognition of Palestinian statehood is connected with the emergence and increasing acceptance of Palestine as a legitimate state actor in international organizations and the UN organs. Palestine had previously joined and become a member of regional and international bodies including the Non-Aligned Movement, the G77, the League of Arab States and the Organization of Islamic Cooperation. Following the UN membership, Palestine has also been able to strengthen its engagement with international organizations and joined, for example, the International Criminal Police Organization in 2017 (Interpol 2017). In addition, in 2018, it acceded to the UN Conference on Trade and Development, the UN Industrial Development Organization and the Organization for the Prohibition of Chemical Weapons (United Nations 2018). Since January 2019, Palestine has also assumed the chairmanship of the biggest UN block of developing countries, known as the Group of 77 and China. During the opening ceremonial speech at the UN, President Abbas explained that “Israel’s continued colonisation and occupation of the State of Palestine” undermines its development and capacity to engage more effectively in international cooperation (Middle East Eye 2019). Therefore, while the obstacles to Palestinian statehood are real and critical on the ground, the UN membership and statehood recognition has allowed Palestine in recent years to increase its institutional presence and involvement with international organizations. More importantly, it has strengthened the status of Palestine as a legitimate state actor participating in the UN organs and organizations within the realm of international relations and cooperation. This represented a significant shift from the previous Palestinian status at the UN as a non-state actor and observer. However, if Israeli occupation and internal obstacles such as Palestinian political fragmentation continue to preclude the achievement of Palestinian statehood and national independence, the recognition of the ‘State of Palestine’ may transform merely into an external project at the UN and risk further detachment from the harsh and contrasting realities in the occupied Palestinian territories. In legal terms, another significant implication for Palestine’s membership at the UN and statehood recognition is securing and utilizing access to international mechanisms of justice and conflict resolution. By achieving the status of a State at the UN, Palestine has been able to gain access to the ICJ. As discussed previously, Palestine disputed the relocation of the US embassy to Jerusalem at the ICJ and cited the illegality of this decision based on international law and violations to the Vienna Convention on Diplomatic Relations of April 1961. The court proceedings are still ongoing but the ICJ has now to deal with two critical challenges. Firstly, the US withdrawal from the Optional Protocol to the Vienna Convention on Consular Relations has ended the US recognition of the ICJ jurisdiction and undermined the role of the court as a legitimate mechanism of dispute resolution in the international system. Secondly, the mandate of the ICJ is primarily concerned with resolving disputes between States. Therefore, not only will Palestine’s case against the US debate the relocation of the American embassy to Jerusalem in accordance with the Vienna Convention on Diplomatic Relations but it will lead to further legal discussions concerning the question of Palestinian statehood. In addition, as a result of the UN recognition of Palestinian statehood, Palestine has developed the capacity to engage with the ICC in recent years. This, for example, has allowed the Palestinians to seek accountability for Israeli illegal actions in Gaza and the West Bank and lodge charges of war crimes against Israel at the ICC (International Criminal Court 2015). Stronger possibilities rest with the evolving involvement of the ICC in the Palestinian issue. The role of international institutions is increasingly being recognized in relation to upholding international law in States which are experiencing conflict and human rights abuses. Moreover, bringing the Israeli-Palestinian conflict into the ICC and providing victims in Palestine with direct recourse to justice could deter Israel’s practices and facilitate action by international governments and organizations to protect Palestinian human rights (Azarov 2013). In this context of seeking responsibility and ending impunity, not only do international legal institutions provide new venues for reinforcing international justice but they also play a critical role in promoting legal alternatives to conflict resolution in the Israeli-Palestinian context. The role of the UN and its organs in the international system is vital to the settlement of political and national conflicts through informal and formal methods. These include mediation, peacekeeping missions, conflict settlement mechanisms and the adoption of Security Council and General Assembly resolutions which may provide directions and guidelines to conflict resolution (Väyrynen 1985). This applies to the Palestinian issue where the UN resolutions, since 1947, have provided guidance on the question of Palestine including partition as a basis for resolution, right of return, self-determination for Palestinians and, more recently, statehood recognition. With the growing awareness of the importance of legal discourses in international law and the return to law in the Palestinian situation, the role of the UN and its associated legal institutions are expected to acquire a stronger role in facilitating conflict resolution in the Israeli-Palestinian context. In political terms, one of the key implications for Palestine’s membership and statehood recognition at the UN is related to changing power relations between Israel and Palestine. Transforming the power imbalance in the political and diplomatic engagement with Israel represented a critical objective for seeking the UN membership. Since the Oslo Accords in 1993, the PLO has officially acknowledged the right of Israel to live in peace and security but Israel has not reciprocated and recognized Palestinian statehood through formal negotiations. However, following the UN membership, the transformation of this unequal political relationship at the state-level has become an emerging reality. The issue is no longer between Israel and a non-state actor. The PLO’s changing approach on the need for mutual statehood recognition following the UN initiative is evidence in point. The PLO’s current peace proposal and vision for peace with Israel includes the recognition of Palestinian statehood and Palestine’s right to exist within the two-state formula of Palestine and Israel living in peace and security and within recognized borders (Palestine Liberation Organization 2014). Therefore, the UN recognition of Palestinian statehood has provided Palestine with the prospect of reversing the long decades of unequal power relations and advocating nationally and internationally for a new political relationship with Israel on the basis of equal sovereignty. This article has revisited the question of Palestine’s membership at the UN and statehood recognition. Recent developments since October 2018 have provided strong reasons to revisit this question in scholarly and analytical terms. These developments have included the Israeli-US disengagement from the UNESCO, which has strong roots in admitting Palestine as a member into the organization in 2011, and the US withdrawal from the Optional Protocol to the Vienna Convention on Consular Relations concerning the Compulsory Settlement of Disputes in response to the case brought by the State of Palestine to the ICJ against the relocation of the US embassy to Jerusalem. While acknowledging the ongoing contention and diplomatic frictions surrounding the issue of Palestinian statehood, the article has argued that Palestine’s membership and admission as a non-member observer State at the UN has continued to present evolving implications and promising possibilities for Palestine’s quest for recognition and statehood in the areas of international relations, law and politics. The evolving implications have included (a) the emergence and increasing acceptance of Palestine as a legitimate state actor in international organizations and the UN organs, (b) securing and utilizing access to international mechanisms of justice and conflict resolution including the ICJ and the ICC, and (c) transforming the unequal power relations between Israel and Palestine at the political level. This article is based on the author’s research and contribution to forthcoming book, titled the Routledge Handbook of State Recognition (London 2019). Abunimah, A. (2011) ‘Abbas to let Israel keep settlements even if UN recognizes “state”’, London: Electronic Intifada. Azarov, V. (2013) Tell it to the Judge: Palestine’s UN Bid and the International Crminal Court. In: Palestine Membership in the United Nations. Cambridge: Cambrige Scholar. Burgis-Kasthala, M. L. (2014) ‘Overstating Palestine’s UN Membership Bid?An Ethnographic Study on the Narratives of Statehood’, The European Journal of International Law, 25(3): 680-700. Elgindy, K. (2011) ‘Palestine Goes to the UN: Understanding the New Strategy’, Foreign Affairs, 90(5): 102-106.
International Criminal Court (2015) Palestine Focus: Alleged crimes committed in the occupied Palestinian territory, including East Jerusalem, since 13 June 2014, TheHague: International Criminal Court. International Court of Justice (2018) Relocation of the United States Embassy to Jerusalem (Palestine v. United States of America), The Hague: International Court of Justice. Interpol (2017) ‘The State of Palestine and the Solomon Islands become INTERPOL member countries’, Beijing: Interpol. McMahon, R. and Masters, J. (2012) ‘Palestinian Statehood at the UN’, New York: Council of Foreign Relations. Middle East Eye (2019). ‘Palestine assumes chairmanship of G77, UN’s largest bloc’, London: Middle East Eye. Palestine Liberation Organization- Negotiations Office (2011) ‘Recognizing the Palestinian State on the 1967 border and Admission of Palestine as a Full Member of the United Nations‘, Ramallah: Palestine Liberation Organization. United Nations (2011) Application of Palestine for Admission to Membership in the United Nations, New York: United Nations. United Nations (2012) General Assembly Votes Overwhelmingly to Accord Palestine ‘Non-Member Observer State’ Status in United Nations, New York: United Nations, GA/11317. United Nations (2018) State of Palestine expresses intent to join UNCTAD, New York: United Nations. Väyrynen, R. (1985) ‘Is There a Role for the United Nations in Conflict Resolution’, Journal of Peace Research, 22(3): 190-191. Yaser Alashqar is a lecturer in the International Peace Studies Programme at Trinity College Dublin (the University of Dublin) in Ireland. His areas of research and teaching focus on Middle East politics, political mediation, comparative peace processes, civil society and conflict resolution studies including Israel-Palestinian issues. He has published a number of academic papers and articles related to these topics. He is also an academic member of the Centre for Palestine Studies at the University of London.